Many parents fear their children being bullied, but few even like to think about their child being a bully. The fact of the matter is, however, that any teenager could be a bully. 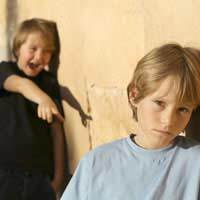 Bullies can be boys or girls, may have been bullied or never been involved in bullying previously, and may bully by teasing or by violence. There are many different types of bullying and those who do bully have often been the victims of abuse themselves. If you suspect your teen is a bully, speak with school officials to find out the full story, discuss these behaviours with your teenager, and try to spend more time with you teenager at this difficult time. If you suspect, or are notified, that your teen is a bully then you need to find out the full story. What has your teen been doing? Who has your teen been doing it to? Has your teen been named as a bully by another teen or has an adult noticed his or her behaviours? Is there a particular pattern to the bullying? By finding out as many details as possible about you teen’s behaviour you can begin to piece together an idea of what (s)he is doing and why (s)he is doing it. However, you’ll only really be able to understand why bullying has begun by speaking about it with your teen. Funny enough, some teens may not even realise that they are bullying others. Many have become so used to seeing inappropriate behaviour around them or in society that they believe some actions, such as teasing others, are completely normal. Other actions, such as if a teen cheats on school work or engages in abuse or violence, are more obviously wrong. Many teens engage in bullying because they were bullied themselves or because they feel insecure or have low self-esteem. Only by discussing bullying with your teen can you be certain of why this behaviour has begun. “Bully” is a term that means different things to different people, but if you spend more time with your teen then you will have ample opportunity to let him or her know exactly what it means for your family. Spending more time with your teen will also allow you to work on building up his or her self-esteem and model the kind of behaviour that you would like him or her to exhibit. This time together should be consistent and perhaps even private, so that teens don’t feel that they need to share you (or your attention) with siblings or other people. Parenting often brings a number of surprises and finding out that your teen is a bully may well be one of them. If you do discover that your teen is bullying others, be sure to speak with school officials to find out exactly what is happening, discuss the situation with your teen and spend more time with your teen to help him or her gain self-confidence and watch you model appropriate behaviour. If you do not feel that you are making progress on your own then enlisting the aid of a professional counsellor or therapist may also be a good idea.